Just because you can buy an expensive house doesn't mean you should. Just because you can skip work today doesn't mean you should... The list goes on. This is especially true in investing and trading, where a too-risky strategy could easily wipe out your portfolio. The simple definition of "buying on margin" is investing with borrowed money from your broker. Like a mortgage loan where the house is collateral, the securities you buy in a margin account are the collateral. And, like any loan, you'll have to pay interest on the money you borrow. Buying on margin can be lucrative, and relatively safe – if it's done right. For example, I've told my readers for years about how to use margin with option selling to generate safe and steady income. But many investors don't fully understand how to use margin properly... or what the risks are. A trader has $20,000, and he's got a gut feeling that shares of company ABC will shoot up over the next few months. He decides to use margin to buy shares, borrowing $20,000 to try and boost his returns. The benefits of using margin are clear. You can make a lot of money if the market cooperates and the stock goes the way you want it to. Using margin, you can easily lose more than 100% of your investment. No matter what happens, you have to pay back the margin loan – even if the stock goes to $0. A margin loan is just as binding as a loan from a bank... It must be repaid in full. If you buy on margin and the stock suffers a steep and sudden decline, your broker may issue what's called a "margin call." This is where you'll have to come up with the money to post the minimum amount your broker requires to cover potential losses, which can be up to 100% of what you borrowed. If you're unable to meet a margin call, your brokerage can sell your stocks without notice to meet this requirement. If this happens, you can often lock in some bad losses during a market downturn. According to the Financial Industry Regulatory Authority (FINRA), investor margin debt hit an all-time high in May at $669 billion. Folks have been taking on record amounts of risk. And that's worrisome. It means when the downturn finally comes, it could be among the worst we've ever seen... When stocks bought with borrowed money fall, it leads to more selling and a faster, more brutal decline. I believe it is important to eliminate any risk you can at the tail end of this decadelong bull market. So if you haven't yet, add some safe, income-generating assets and "chaos hedges" to your portfolio to prepare for when the good times end. And if you're currently trading on margin in your own account, my advice would be to stop doing so now... especially if you're a less-experienced investor, or if you're close to retirement. In both cases, your top priority should be to keep your capital safe. Editor's note: Doc is urging investors to move some money to "safe harbor" investments – the kind that will preserve your wealth and pay you a dependable stream of income. If he's right, getting positioned now could make all the difference to your quality of life in retirement... So be sure to check out his special presentation... before it comes offline at midnight tonight. View it right here for the details. "If you get worried about declines, I've got a simple way for you to become a more successful investor," Doc says. Learn more about one crucial "asset" that can't be bought in a brokerage account here: Every Investor Needs This Asset in His Portfolio. "I'm not saying a market crash or recession is coming today or tomorrow," Doc writes. "But I'm seeing signs that the economy is reaching its high-water mark." Read more about what he's seeing in the big picture today – and what he's doing to prepare – right here. Waste Management (WM) is the leader in garbage collection in North America. This stock is still going strong since we last checked on it in August. Whether the economy is booming or struggling, somebody needs to haul away the trash every week. 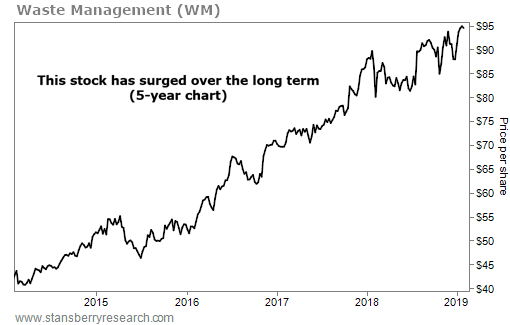 So it’s no surprise Waste Management continues to grow its profits… In the third quarter, the company reported earnings per share of $1.15, up from $0.90 for the same quarter in 2017.